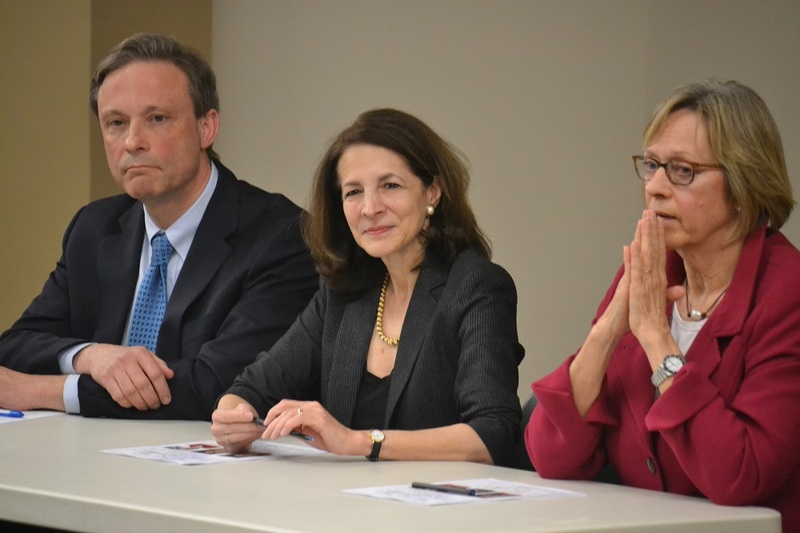 HARTFORD – Norwalk’s GOP delegation of State Representatives Gail Lavielle (R-143), Fred Wilms (R-142) and Terrie Wood (R-141) joined their Republican colleagues in rolling out a budget adjustment proposal for Fiscal Year 2019 ahead of a meeting of the Appropriations Committee. The proposal aims to eliminate Connecticut’s $200 million budget deficit without raising taxes while maintaining funding for transportation, Education Cost Sharing grants, core social services, and tax breaks for seniors, retirees, and working families. More dollars are also dedicated to repaying the state’s unfunded liabilities, including the State Employees’ Retirement Fund, the Teachers’ Retirement Fund, and the Teachers’ Healthcare Fund. The representatives will continue to advocate for further structural changes to state government and reduce funds that had been allocated to bailing out the city of Hartford. Reps. Lavielle, Wilms, and Wood emphasized the prioritization of transportation funding in the budget adjustment proposal by fully funding the Special Transportation Fund (STF) and preventing rail fare increases not already in statute from being implemented in 2018 or 2019. It protects funding for local transit districts for the entirety of the budget cycle without calling for any new taxes or tolls. In the proposal, funding is eliminated from the planned expansion of CT FastTrak to UConn and used to enhance existing infrastructure. Lawmakers have until the 2018 legislative session adjourns on May 9 to complete and pass a budget plan. State Representative Gail Lavielle represents the 143rd district, which includes parts of Norwalk, Westport, and Wilton. She is Ranking Member of the General Assembly’s Education Committee and a member of the Finance, Revenue, and Bonding Committee and the Transportation Committee. State Representative Fred Wilms represents the 142nd General Assembly district communities of Norwalk and New Canaan. He is a member of the Appropriations Committee, the Planning and Development Committee, and the Transportation Committee. State Rep. Terrie Wood represents the 141st General Assembly district which includes Darien and part of Norwalk. She is Ranking Member on the legislature’s Executive and Legislative Nominations Committee, and serves on the Human Services and Finance, Revenue and Bonding Committees. And the Democrat Legislator plan championed by Sen. Duff is ? The sad reality is that CT’s fiscal and economic problems go back decades courtesy of both Parties. And without a full time Legislature offering good pay and support sufficient to attract capable real public servants up to date with colelge level economics and finance we’re not going to make the progress we need. Hoping a new Governor will “save CT” is as unrealistic as hoping a new CEO will restore GE’s once vaunted glory. So far none of the candidates from either Party have unveiled a detailed budget and economy plan of recovery that’s worthy of careful review from acknowledged analysts familiar with CT’s economy. And if past elections are any guide they will not be forthcoming. Suggesting none of the candidates has put together a team of experts or well qualified advisors. Just the old swan song “Here’s what we’re going to do”. Sure. CT remains severely handicapped with its small population spread across 169 towns, once proud cities now dependent on State aid (save Stamford) and near complete absence of major manufacturing or hi tech facilities outside its 3 modest sized Defense firms. We neither attract major new business nor spend to create a modern hi tech well educated labor force in our major cities. So our goose is cooked. And the line-third of our population living in our State Aid dependent larger cities really have no future without sources of good jobs. That’s the real measure of CT’s politicians. Legalize recreational marijuana and hemp.